This post would have gone out last week, but it just didn't feel right to be putting it out while the tragedy in Japan was unfolding. Not sure that the time is right even now, but here it is anyway lest it become completely outdated. To coincide with GDC this year, Giant Robot S.F. 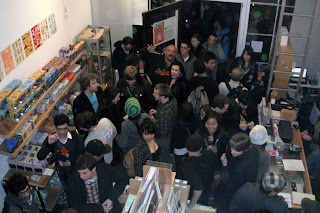 opened it's fourth annual game inspired art show to a huge crowd. Getting into and through Game Over 4 during the opening reception was not for the faint of heart. Outside GR-SF the masses blocked entry and passage to the point of having to be broken up by local police. Inside the small gallery space, the line was at a standstill. In retrospect, I should have timed how long it took me to get through just for fun. The video game inspired art spans multiple mediums both traditional and digital, hung salon style with varying degrees of professionalism. While some pieces were framed and displayed well, others were works on paper simply tacked up on the wall. Not exactly what one might expect from a show garnering national media attention from the likes of Wired and Game Set Watch. Logistical issues aside, the quality of artwork in Game Over 4 was a less mixed bag. With a huge roster of artists numbering 54 in total it's essentially impossible that every piece would appeal to every viewer. Especially when it comes to the subject matter of video games, which in many cases touches on very personal experiences. Each person who has played games will have those specific titles that are associated with certain fond memories. The artwork that brings out those feelings and nostalgia will differ for each of us. Since I can't tell what is going to pluck your nostalgic heart strings, allow me to get personal and look at some of what spoke to me as both a gamer and artist. Don't forget to check out all the art after the jump. Cats shooting lazors from their eyes, destroying a Mario Bros. mushroom is a win win situation. Artist Jeni Yang put a lot of effort into this piece and her other contribution to the show. Love the isometric take on FFVII by Jesse Fillingham. The scruffy treatment given to cloud and the giant are a nice touch. This somehow combines my memories of FFVII with other more old school experiences with isometric strat-RPGs. Space Invades ceramic plate is gorgeous. Nevermind that I didn't play much during the Atari days. This is still something I would hang on my wall because I love it when art takes from digital gaming and puts it into a strictly analog and earthy medium. One of my favorite pieces in the show is the rainbow SNES over a Super Mario World map. This is for those aforementioned personal reasons. The SNES was one of my big nostalgic systems and Super Mario World was some interesting memories attached to it. While the execution in this piece is not of the highest quality, the concept is great. Besides, who doesn't love a combination of rainbows and SNES? An homage by Cory Schmitz. I did not realize the significance of it's demise at the time, but it would later become an object of some fascination for me. R.I.P. Sega Saturn. You are missed. The pixel art giclee prints by Jude Buffum of Super Mario Bros, Zelda, and Castlevania terrariums are rather brilliant. Still thinking about the meaning behind encasing them in glass, but the idea seems genius. While my love for Chrono Trigger is not as strong as other gamers', I do love the Frog portrait. It manages to capture the character's essence perfectly and makes me feel all fuzzy, warm, and a little sad at the same time. The small, backlit pixel environments from Sword & Sorcery are incredible. Not to mention impossible to take a picture of in a gallery. 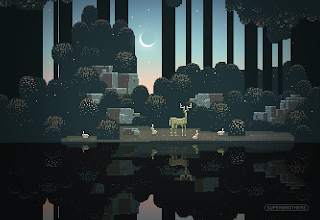 The pixel art is so emblematic of many indie games I have played in recent years and their ambiance is somehow deeply touching. More than any others, they remind me of Nifflas' games, like Within a Deep Forest, Knytt and Knytt Stories. I have wanted to play this game since first seeing the videos on their site some time ago. Waiting is the hardest part. Did you make it out to Game Over 4? What pieces spoke to your kid-in-jammies-playing-games heart? Let me know in the comments. More photos from the opening and of the artwork are also available at Giant Robot's flickr sets here and here. A few more from yours truly below.